Whatever your favourite type of landscape, you’ll find it in Northumberland. And as you seek it out and enjoy its wonders, you’re unlikely to be among hordes of other people doing the same. The county is a walkers’ wonderland with a special treat in its south west corner: Isaac’s Tea Trail. The 36-mile route in the North Pennines is named after a Victorian tea pedlar, Isaac Holden, and it is as much a journey through history as a fine walk through fabulous scenery. Most people start it in the village of Allendale, although it can be started at any point and walked clockwise or anti-clockwise. From Allendale the Tea Trail follows the River East Allen upstream before hopping over high moors to Nenthead and then following the River Nent downstream to Alston. Then after joining a short section of the Pennine Way above the River South Tyne, it heads up and over the moors again to the valley of the Mohope Burn which flows into the River West Allen. From there the return to Allendale is over high pasture, through woodland and alongside the River East Allen. The route is well signposted, and you’ll often see old teapots in the gaps of stone walls, teacups hanging from waymarkers and vintage tea adverts as a reminder of Isaac Holden’s trade. He was born into a lead-mining family in around 1805 and went to work at the mine as a boy. Ill health and the decline of mining forced him to find other work, and he ended up running a grocery in Allendale. He sold his tea door-to-door, walking miles to remote farms and hamlets, and at the same time raised money for community projects. Walking Isaac’s Tea Trail you will pass reminders of many of his fund-raising achievements. You will also enjoy a wonderful variety of scenery, from high heathery hills to leafy dingly dells. There are a few oddities to look out for along the way. There’s an RAF Jet Provost parked in a farmyard, there’s a sinister stone troll under a footbridge, narrow-gauge steam trains can suddenly come chugging through the view, and the route passes a miniature village which is gradually taking over the garden of a bungalow. Everywhere along Isaac’s Tea Trail there are signs of the area’s rich heritage. The remains of a Roman fort and ramparts are clear to see, bastle houses testify to the tyranny of the Border Reivers when homes had to be fortified against violent raiding parties, and there is extensive evidence of lead mining. The industry’s heyday was in the 18th century, when this region was world famous for producing lead and other minerals, but although mine workings are still visible, they are certainly not scars on the landscape. They are evocative and fascinating, and an integral part of the North Pennines scenery. I’ve been walking parts of Isaac’s Tea Trail regularly since I started my blog in October 2015 and I never get bored with it. Each season brings different delights and I can always find a section of the Tea Trail that matches my mood, energy levels and the day’s weather conditions. Walking conditions along the 36-miles of the Tea Trail vary from level grassy paths to steep stony tracks. There are some boggy sections and the high-level moorland crossings are exposed to the elements, but I don’t consider myself a strong walker and the route is within my capabilities. Mind you, I only do short sections of it and I haven’t walked it all in one go. If you want to do the whole route as one expedition, the official guide recommends four sections: Allendale to Nenthead (11miles/18km), Nenthead to Alston (6 miles/9km), Alston to Ninebanks (12 miles/19km) and Ninebanks to Allendale (8 miles/13km). In total there are more than 5,000 feet of ascent. 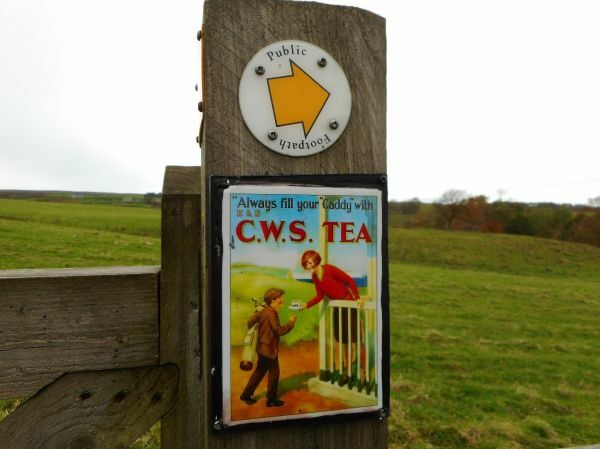 As the route celebrates a purveyor of tea there are many refreshment opportunities along the way. 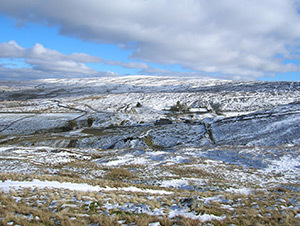 Cafes and pubs in Allendale, Nenthead and Alston are directly on Isaac’s Tea Trail, and a short detour takes you to similar establishments in Allenheads and Whitfield. There is accommodation at each location, and a Youth Hostel at Ninebanks. 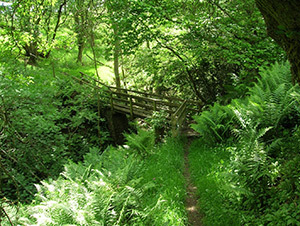 The Tea Trail was created in 2001 by Roger Morris as part of his passion for the region’s history, and its reputation as a great walk attracted TV presenter Clare Balding to sample a section of it for her Radio 4 series Ramblings. 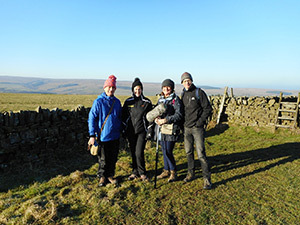 In the photo below Roger Morris is on her right, with her producer Lucy Lunt and Andy Lees from the North Pennines AONB Partnership on her left. By all accounts Isaac Holden was a bit of an eccentric, but his fund-raising brought genuine benefits to the poorer people of the North Pennines in Victorian times. I often think of him as I walk the paths he must have walked, and I hope he stopped to enjoy the views and the special nature of this area. I certainly do, every single time I’m out there. To read more about Isaac’s Tea Trail follow Anne’s blog and the Allen Valleys website where there is more information about Isaac’s Tea Trail including a link to Clare Balding’s Radio 4 Ramblings programme, and information about where to buy the official guide to the Tea Trail.